Sakura of America and the founders of Zentangle®, Inc. are excited to announce a new partnership and the upcoming launch of a line of licensed Zentangle pen sets. Zentangle helps people of all skill levels enjoy drawing and discover a creativity they never knew they had. I firmly believe that your activity deepens students' ability to work in a focused way, releases creative energy, and builds confidence and self-esteem. And most important, we all had a great time together doing it. Sakura of America and the founders of Zentangle®, Inc. are excited to announce a new partnership and the upcoming launch of a line of licensed Zentangle pen sets. These are the first and only licensed Zentangle drawing sets and will be available for purchase at retail stores in early 2012. These new and convenient Zentangle pen sets will come in three varieties. The 11 piece set includes 5 Pigma Micron® pens, 1 Zentangle pencil, and 5 official 3.5” x 3.5” original Zentangle tiles. The 9 piece set includes 3 Pigma Micron pens, 1 Zentangle pencil, and 5 official 2.5” x 3.5” Artist Trading Card sized Zentangle tiles. The 3 piece set includes 3 Pigma Micron pens. The Zentangle art form and method were created by Rick Roberts who lived as a monk for many years, and world-renowned calligrapher, Maria Thomas. Rick and Maria wanted their Zentangle kit to include only the best materials and after extensive testing, they selected the finest paper and Sakura’s Pigma Micron pens. Pigma® ink was invented by Sakura over 25 years ago, and continues to be the most reliable permanent ink on the market today. What makes Pigma ink special is that it is created with pigment molecules instead of dye molecules. Pigment molecules are 100 times larger and more chemically complex than dye molecules, making them less susceptible to UV rays and degradation. This makes Pigma ink inherently longer lasting than dye-based inks. Enthusiasts from all over the world have discovered the wonderfully addictive nature of Zentangle. Many people have dedicated their time and resources to attend special training with Rick and Maria to become Certified Zentangle Teachers (CZTs). The Zentangle method is an easy to learn way to create beautiful images using repetitive patterns. People who use this fascinating new art form say it’s fun, relaxing, and provides artistic satisfaction and an increased sense of well-being. Because of its compact size and simplicity of components, Zentangle art can be created almost anywhere, alone or in groups, without any special abilities or costly equipment. Zentangle is enjoyed by people of all ages and skill sets, and is used in areas including arts and crafts, education, and corporate settings. Charles Plant, the principal of Peace Street Campus of the Met School in Providence, RI writes, “we observed profound changes in students' ability to focus and concentrate while engaged with Zentangles. I firmly believe that your activity deepens students' ability to work in a focused way, releases creative energy, and builds confidence and self-esteem. And most important, we all had a great time together doing it." Other users have commented that Zentangle artwork is, “very relaxing and fun,” and, "makes you feel more confident because you have accomplished something you didn't think you could." The new Zentangle sets will be available for purchase through retailers, Zentangle.com, and Certified Zentangle Teachers (CZTs) in early 2012. Zentangle® is a registered trademark of Zentangle®, Inc. Learn more at http://www.zentangle.com. Headquartered in Hayward, CA, Sakura Color Products of America, Inc. is the U.S. subsidiary of privately held, Sakura Color Products Corp. of Osaka, Japan. Sakura also manufactures the popular Gelly Roll® gel pen, Pigma® Micron fine-line pens, as well as many other high-quality writing instruments and art materials. 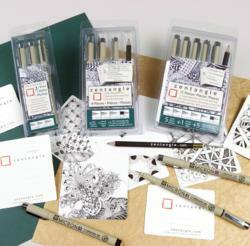 For more information about Zentangle sets, visit http://www.sakuraofamerica.com/zentangle-sets.